I took these WIWW photos yesterday. I was not having the best day. I woke up feeling a little emo, tired, and crampy. (It happens even to the best of us!) I knew I had to put on some fabulous clothes to feel more like myself. 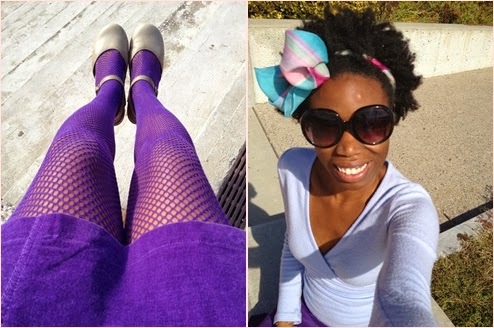 I randomly felt drawn to wearing an all purple outfit. Some internet research shows I couldn't have made a better choice. According to ColorMatters.com, purple is considered the most powerful visible wavelength of electromagnetic energy. Kids associate it with happiness. Light purples are light-hearted, floral, and romantic. The dark shades are more intellectual and dignified. Wow! Those were definitely qualities I needed more of. Who knew The Law of Attraction even got as specific as clothes! I also made a point to walk past a neighborhood house that has tons of wild lavender growing in the front yard. Did you know lavender herb can create a positive mood and help to alleviate mild feelings of agitation or distress? I did, that's why I rubbed up those magical bushes like nobody's business! What color do you wear to feel more like yourself? I'm just going to put this out there: you have the best smile. Ever. Seriously, just coming to your page and seeing your smiling, happy face makes me smile, too. And all of this on a day you were feeling anything but smiley!? Amazing. thanks for telling me about Spirit Day. that's so cool!!! !